See how loose it was in the back? 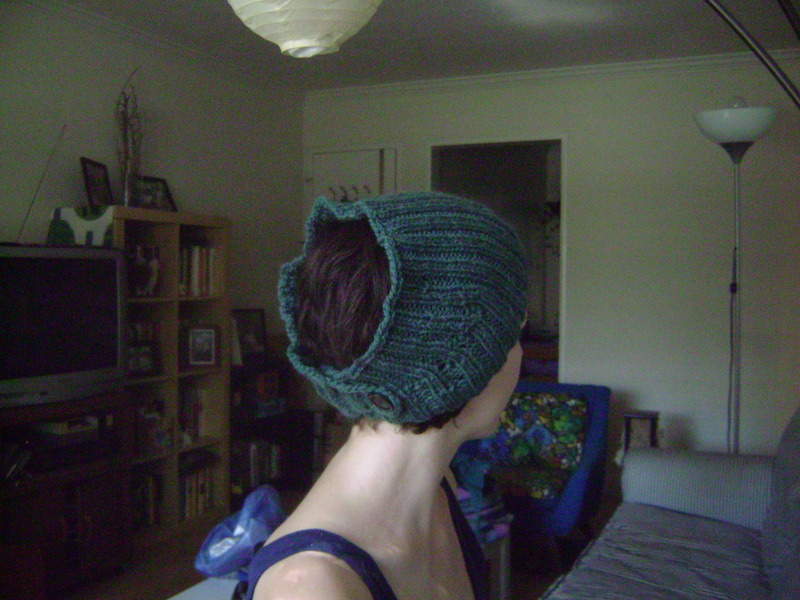 It barely stayed on my head, and that was before it stretched out. 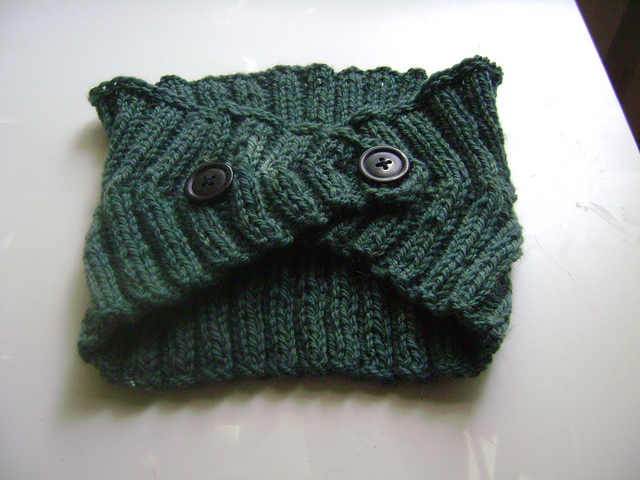 I even overlapped the ends and did two buttons to try to keep it in place, to no avail. 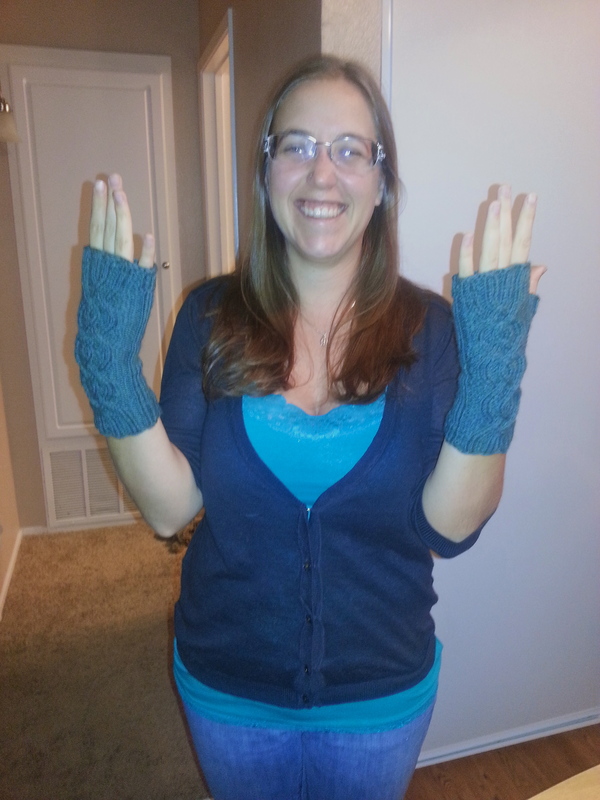 Fast forward a year or so and I was planning to make some fingerless mitts for a friend’s birthday. She chose the Vancouver Fog pattern, with its beautiful cable pattern, and I just knew that this was the right yarn for the job. 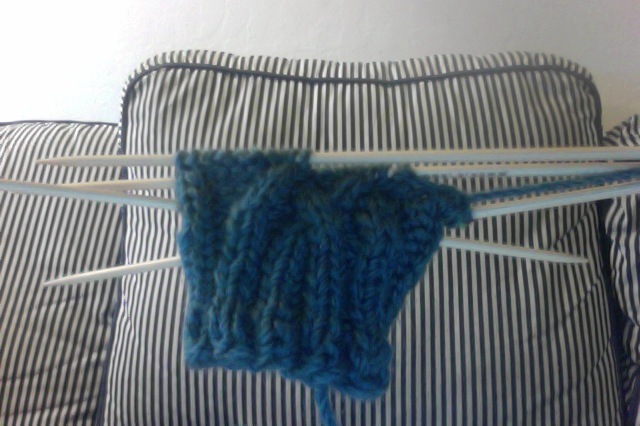 So I frogged Calorimetry and started remaking this muted, spruce colored worsted weight yarn into hand warmers. 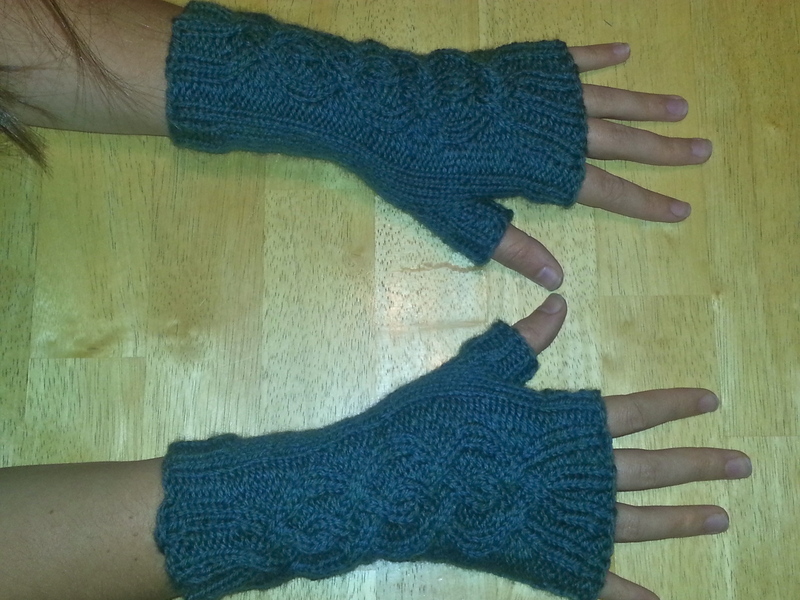 These fingerless mitts were a good fit, and I got to practice some cool cabling techniques. I’m quite pleased with my decision to frog the original pattern. 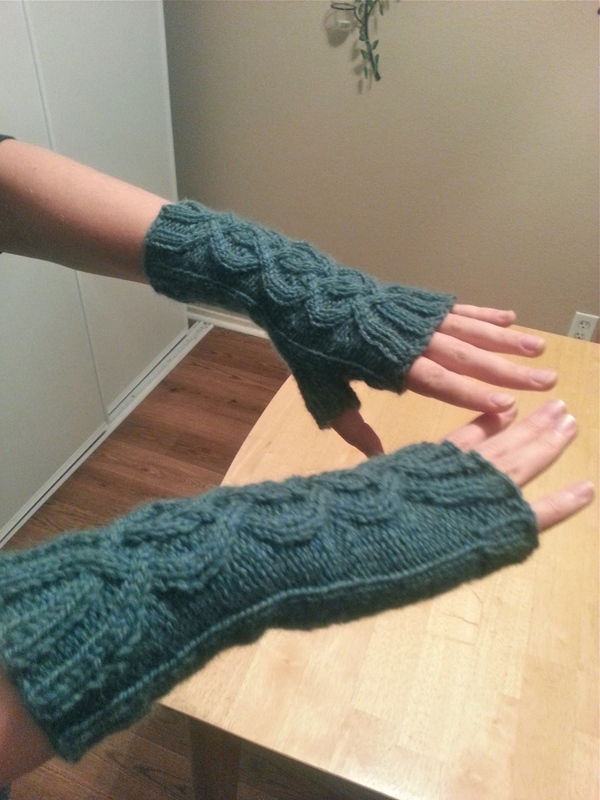 Fingerless mitts are great for those times when it’s too cool out for bare hands, but not cold enough for gloves! 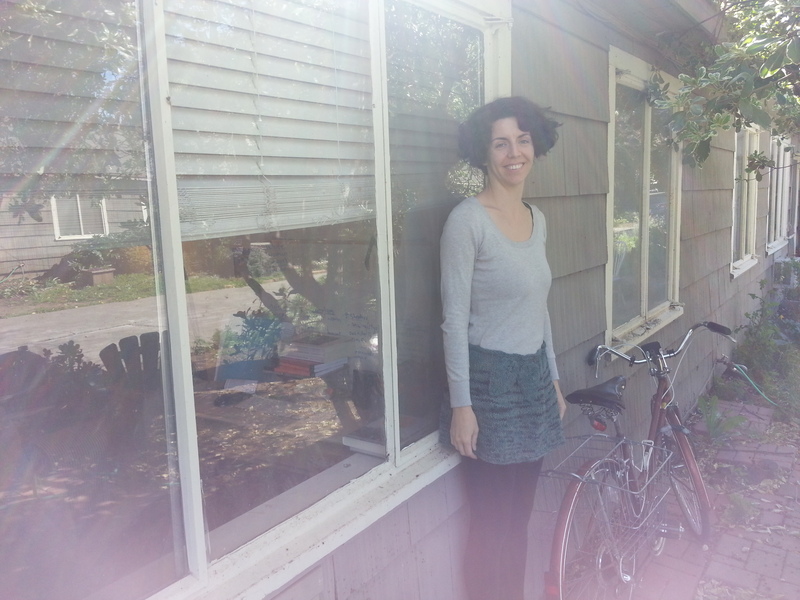 However, I almost always wear my version in a different way now—as a skirt! 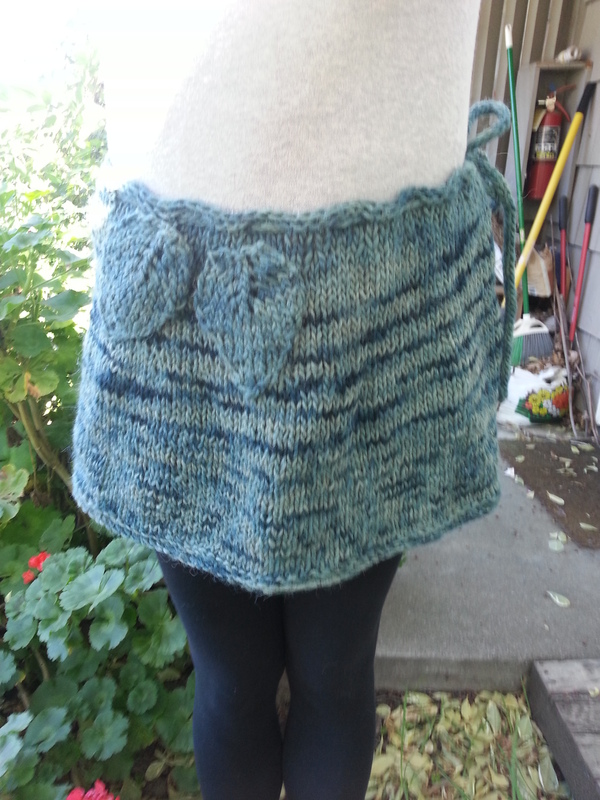 The yarn was just a little too scratchy to be touching my arms/neck, so I made an I-cord and wove it through the top band, then tied the I-cord at my waist. I added some leaves because, you know, I love leaves—I have no idea where I got the pattern for them, but the standard knitted leaf pattern seen here. 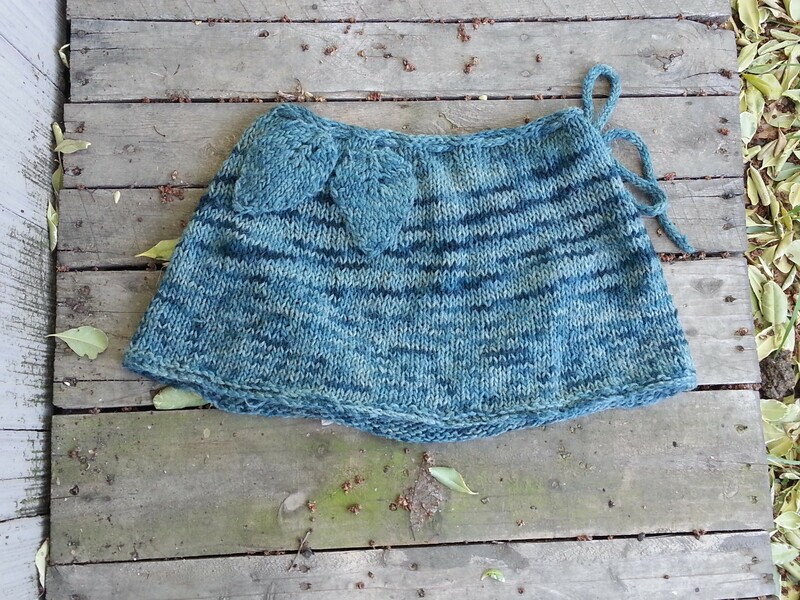 I still wear this skirt fairly often—it’s great with a pair of leggings, and it’s nice when it’s just a little bit cool out. 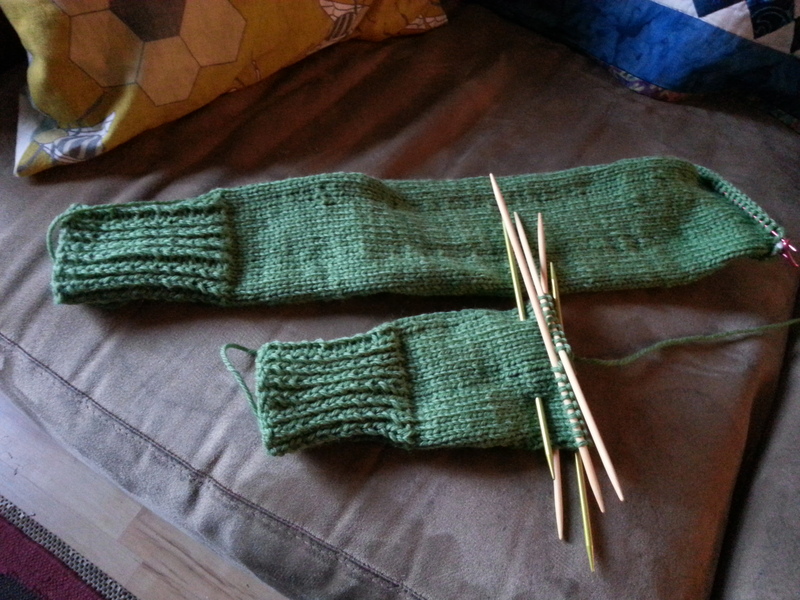 My final green project is still on the needles! It’s the Mrs. Darcy Cardigan by Mary Weaver in Knits that Fit (and unlike most of my knits, this one required checking out a book at the library).With a title like that, it’s only appropriate to do a lot of tweaks to the pattern, right? It may not be obvious from the photo above, but I’m making the arms much longer than the pattern calls for to accommodate my arms and shoulders. 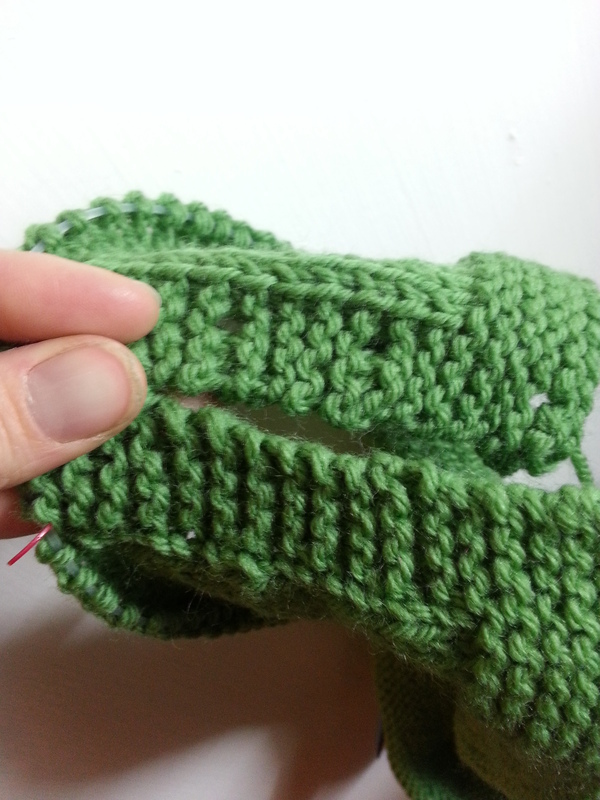 I wish I had known before I made these that to get the true twisted rib, others knitters knew to p1 to back on the wrong side, because the pattern doesn’t indicate this and the ribbing on the cuffs won’t look as sharp as it could. I’ve since moved on to knitting the body. 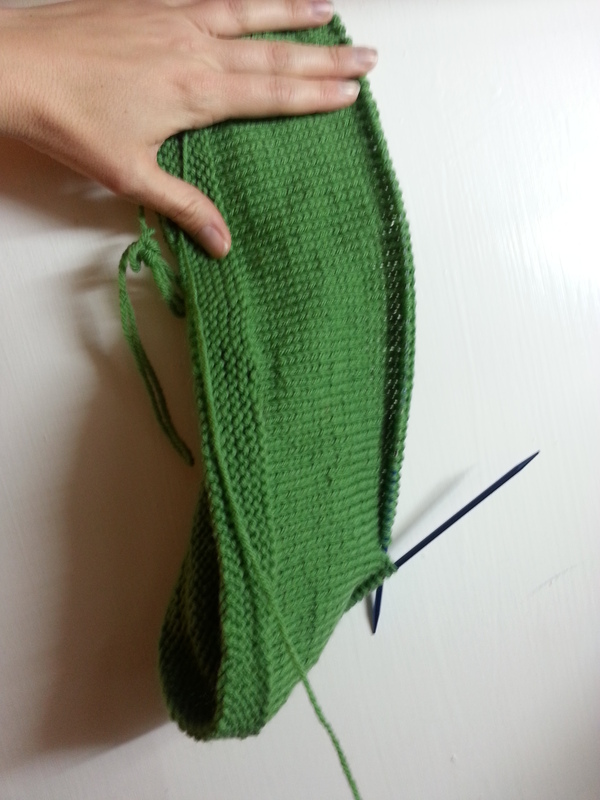 You’ll have to forgive the blurry action shot here, but at least it captures the true green of the yarn! 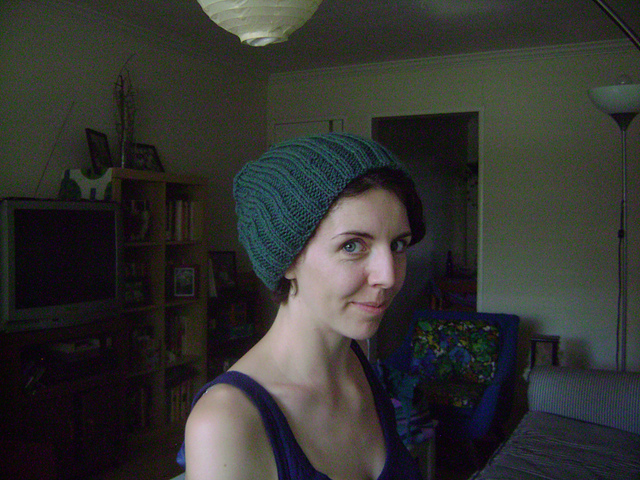 (It’s Cascade 220, in, you guessed it, Spring Green.) 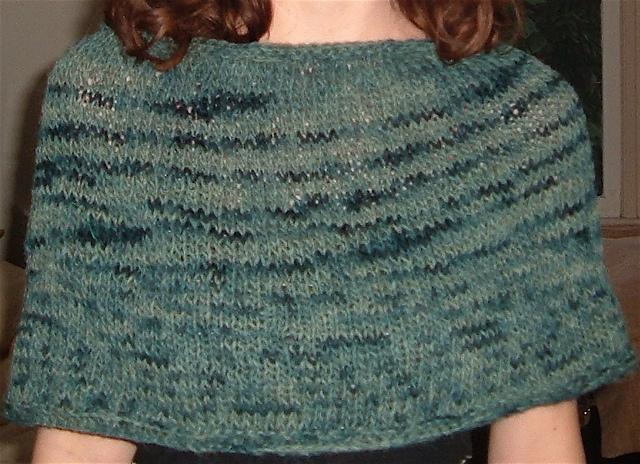 I decided that since I have a long torso that is quite wide at the top, I’d use ravelry user wakenda’s modifications to get a gentler slope on the cardigan’s v neck, which I think will still be quite striking. I’m always a little hesitant to blog about my works in progress, but this partway knit green cardigan is too verdant not to share, and cardigans are great for spring weather. Hopefully this post will inspire me to finish it soon! *bonus postscript announcement* If you read this far, you might enjoy the fact that I recently added categories to the blog, and then went back and retroactively categorized every past post! I created the categories based on what I seem to write about most, so you can find similar posts without having to scroll through past years.